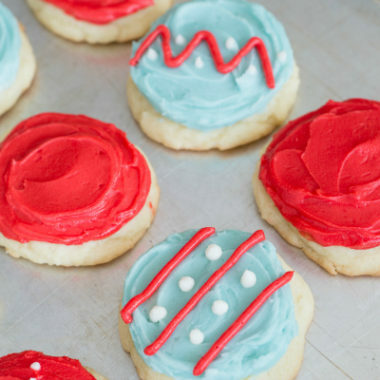 The most delicious and easy sugar cookie recipe EVER! Preheat oven to 400. Mix butter, sugar, eggs, and vanilla thoroughly until well combined. Blend in flour, baking powder, and salt. Cover and chill 30 minutes (or longer) if desired. Heat oven to 400 degrees. Scoop dough onto cookie sheet (I used 1/4 cup cookie scoop but you can make them as small as you like) and flatten each cookie a little bit with a cup or other flat surfaced item. Tip: if its too sticky dip in white sugar between cup flattening. Bake for 8-10 minutes until edges are just beginning to brown. Cool completely. For frosting, mix all ingredients together with a hand or stand mixer until creamy and well combined. Mix in food coloring if desired. Frost cookies after they have completely cooled.